In 1996, while traveling together on a plane, Rob Whiteley of Liberation Farm said to Fred Seitz of Brookdale Farm that Bluegrass farm workers deserved greater recognition and support for their tremendous contribution to the industry. This hard-working group is often described as the backbone of the breeding industry, which provides the foundation for the entire Thoroughbred racing industry. 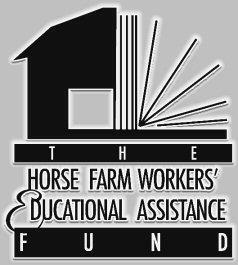 Seeking a way to honor and recognize the horse farm workers, Whiteley, Seitz, and Tom Evans of Trackside Farm formed the Horse Farm Workers’ Educational Assistance Fund, a scholarship assistance program for the children of full-time Thoroughbred horse farm employees in the central Kentucky region. Governed by a volunteer Board of Directors and coordinated by Executive Director Muffy Stuart, the Fund since its inception has provided 550 annual scholarships totaling over $1.1 million. “We are very proud of our scholars,” said Stuart. “They are fascinating kids with an incredible work ethic, undoubtedly instilled in them by their parents.” After finishing their education, a significant number of scholars have returned to work in the horse industry. While the Fund’s scholarships are based on financial need, full tuition is rarely covered and applicants are required to apply for federal student aid as well. The average annual scholarship is $2,000 and nearly all of the scholars supplement their scholarships by working part-time during the school year and full-time between semesters. “The board feels strongly that it is important for each scholar to have some responsibility and to take pride in that responsibility,” shared Stuart. Stuart is often in direct contact with scholars throughout their educational journey. “We don’t just award funding and move on. Scholars will often call me for advice, a reference or a specific contact.” Additionally, the Fund’s directors are very accessible to scholars and often assist in an advisory role. Importantly, The Fund conducts significant follow up on all scholarship recipients. Scholars must provide transcripts after each semester and re-application with another personal interview is required each year.